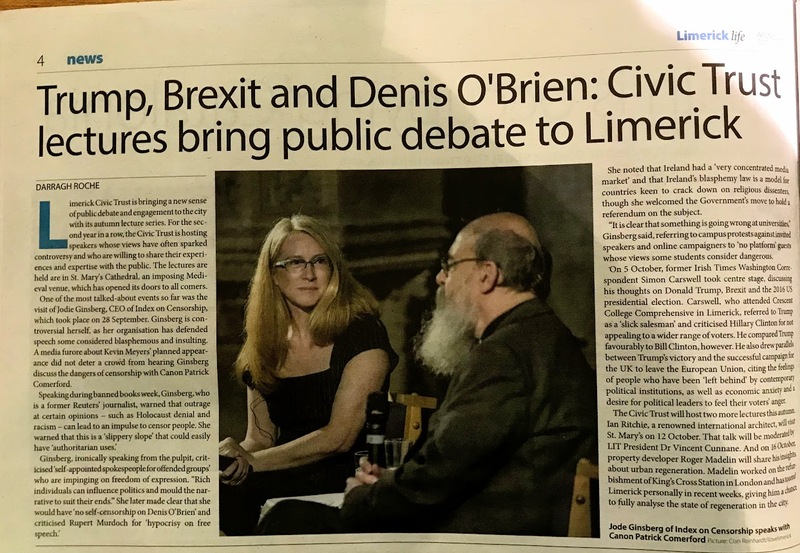 Limerick Civic Trust is bringing a new sense of public debate and engagement to the city with its autumn lecture series. For the second year in a row, the Civic Trust is hosting speakers whose views have often sparked controversy and who are willing to share their experiences and expertise with the public. The lectures are held in St. Mary’s Cathedral, an imposing Medieval venue, which has opened its doors to all comers. One of the most talked-about events so far was the visit of Jodie Ginsberg, CEO of Index on Censorship, which took place on 28 September. Ginsberg is controversial herself, as her organisation has defended speech some considered blasphemous and insulting. 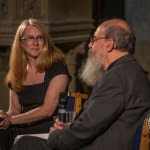 A media furore about Kevin Meyers’ planned appearance did not deter a crowd from hearing Ginsberg discuss the dangers of censorship with Canon Patrick Comerford. She noted that Ireland had a ‘very concentrated media market’ and that Ireland’s blasphemy law is a model for countries keen to crack down on religious dissenters, though she welcomed the Government’s move to hold a referendum on the subject. “It is clear that something is going wrong at universities,” Ginsberg said, referring to campus protests against invited speakers and online campaigners to ‘no platform’ guests whose views some students consider dangerous. On 5 October, former Irish Times Washington Correspondent Simon Carswell took centre stage, discussing his thoughts on Donald Trump, Brexit and the 2016 US presidential election. Carswell, who attended Crescent College Comprehensive in Limerick, referred to Trump as a ‘slick salesman’ and criticised Hillary Clinton for not appealing to a wider range of voters. He compared Trump favourably to Bill Clinton, however. He also drew parallels between Trump’s victory and the successful campaign for the UK to leave the European Union, citing the feelings of people who have been ‘left behind’ by contemporary political institutions, as well as economic anxiety and a desire for political leaders to feel their voters’ anger. The Civic Trust will hold two more lectures this autumn. Ian Ritchie, a renowned international architect, will visit St. Mary’s on 12 October. That talk will be moderated by LIT President Dr Vincent Cunnane. And on 16 October, property developer Roger Madelin will share his insights about urban regeneration. Madelin worked on the refurbishment of King’s Cross Station in London and has toured Limerick personally in recent weeks, giving him a chance to fully analyse the state of regeneration in the city.